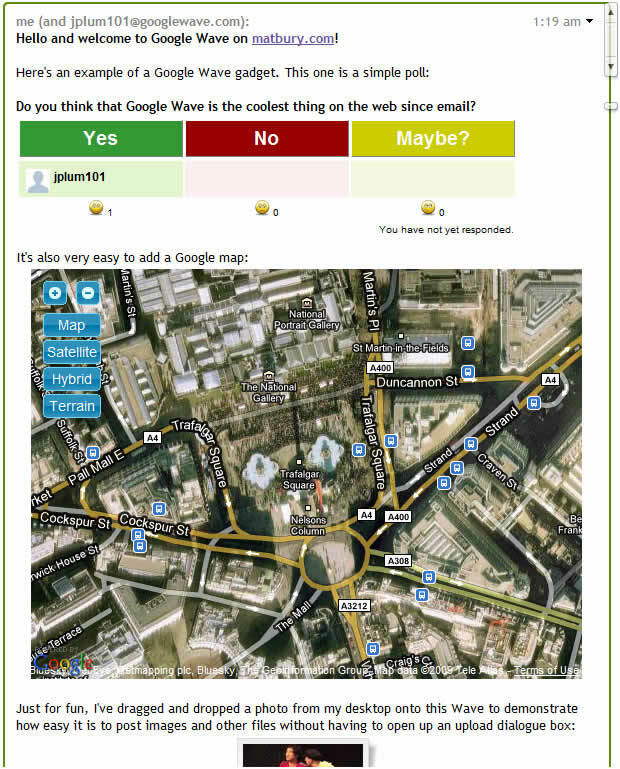 In a previous article, I wrote about a new web communication protocol being developed by Google called Google Wave. Well, five months later, I finally have my Google Wave developer’s preview invitation and I can start creating waves and experimenting with my very own account. Embedded in this article below is a Wave hosted on wave.google.com. Unfortunately, Google Wave hasn’t gone fully public yet so the only people who can see and interact with the embedded Wave are other developers with preview accounts. For the vast majority of readers of my blog, I’m afraid you’ll have to make do with a snapshot image of how it looked when I first wrote this article. Due to the dynamic and collaborative nature of Waves, this one will change over time as more people make their own contributions. Eventually, when Google Wave goes public, you’ll be able to see it, interact with it, post your own comments, add images and files, gadgets, etc. There’s a great atmosphere of buzzy anticipation among the privileged few who have developer preview accounts and the growing community is constantly speculating about how this will shape the future of web communications. I believe that this new protocol, which is open source and available to everyone, will bring about a revolution in on-line communication and collaboration. Google are promoting it as a replacement for email, although I personally doubt that this will be the case. I think it certainly will have a huge impact on social networking. How this will unfold, we can only wait and see. How will it affect e-learning? As I wrote in my previous blog post on Google Wave, I think this new protocol is particularly relevant to e-learning and learning management systems. At the moment, having these real-time, on-line, communicative and collaborative tools comes with a hefty price tag and companies such as WebEx (Cisco Systems) and Adobe Connect charge such high prices for their services that only large corporations and organisations with big budgets can afford to use them. Google Wave promises to level the playing field and make high-end web telecommunications as cheap and easy to use as email. Expect to see web conferencing and real-time on-line classrooms at a school, college, academy or university near you soon! Also, since it’s an open protocol and the software is open source, anyone can create gadgets, plugins and interfaces for it. Propelled by heavy demand, Google are already setting up a marketplace for them as we speak. I expect most of the new applications will be available for free. I can already see learning management system developers scrambling to create plugins that will leverage Waves for e-learning purposes. For learners at least, the future looks bright, the future looks exciting. More and more developers are getting onto Wave and developing plugins/widgets/gadgets/whatever you want to call them, some of which integrate Waves with other sites such as Facebook, MySpace, etc. These integration plugins are not secure and could expose your web accounts to hackers, spambots, spy-ware and other security threats. Under no circumstances should you use these plugins on the open web. You find your Facebook account, bank account and/or identity belong to a Mafia gang in Nigeria, Russia or China faster than you can say, “How did that happen?” You’ve been warned! If you have a Google Wave account and you’ve signed in, you should see a live Wave below. You can sign up for a Wave preview account here. Google have deprecated Wave as a standalone service. It’s now incorporated into Google’s other services such as Docs and G+. Several HD (high definition) web cameras have appeared on the market recently promising to record up to 1400 by 900 pixel resolution video for an outlay of around €100 or less. The specific webcams that I’ve seen are the Logitech Quickcam Pro 9000, the Microsoft ???? and the Creative ????. Although these cameras are capable, in theory, of the claimed results, it’s important to bear in mind what else is necessary to achieve them. Unfortunately, the average PC or Mac on sale today does not have the processing power required to compress and record a high resolution video stream. They’ll struggle with even relatively low resolution video streams and usually compensate by automatically reducing the frame rate from 30 frames per second to as low as four frames per second. In order to record high definition video from a webcam at 30 fps, you’d need a very powerful computer to do so. Something like an extreme gamers PC. To be honest, you’d get better results from getting a “normal”, cheaper PC and spending the money you’d save on a high definition video camera. Plus, it’d be a lot more flexible and easier to shoot on location plus you’d get the added benefits of optical zoom and no PC fan noise in the background to deal with. I’ve had quite a few inquiries about using web cameras to record video for e-learning purposes. On the face of it, it seems to be an easy way to record high definition video very cheaply. In this article, I’m going to talk about what’s available at the moment and what you can realistically expect from an HD web camera. Several HD (high definition) web cameras have appeared on the market recently promising to record up to 1280×720 pixel resolution video at up to 30 frames per second for an outlay of around €100 or less. The specific webcams that I’ve seen are the “Logitech Quickcam Pro 9000“, the “Microsoft LifeCam Cinema” and the “Creative Live! Cam Socialize HD“. Although these cameras are capable, in theory, of the claimed results, it’s important to bear in mind what else is necessary to achieve them. Unfortunately, the average PC or Mac on sale today does not have the processing power required to compress and record a high resolution video stream. Only the Microsoft product information appears to be completely open and honest about this, recommending an Intel Dual-Core 3.0 GHz or higher CPU and at least 2GB of RAM. Less powerful computers will struggle with high resolution video streams and usually compensate by automatically reducing the frame rate from 30 frames per second to as low as four frames per second, hence the words “up to” next to the frame rate you’ll see in manufacturers’ descriptions. The effect of a slow frame rate on video is quite noticeable: if anything in view moves, it gets blurred. This really defeats the whole point of high definition which is clear, sharp image quality. To see this in action, have a look at the many web camera reviews posted by users on YouTube.com and look for anyone who moves their head or hands in front of the camera. You can then compare these with reviews of 3CCD high definition camcorders to see the difference. Also, you’ll need to acquire software that is capable of compressing and recording the webcam video stream to a high quality format, the best one being MPEG -2 (DVD quality). If the video stream is compressed too much, for example with H.264 (MP4 or MOV), any subsequent editing or recoding that you do will substantially reduce the image quality. To be honest, you’d get better results from getting a “normal”, cheaper PC and spending the money you’d save on an MPEG-2 high definition video camera. It’d be a lot more flexible and easier to shoot on location plus you’d get the added benefits of decent optical zoom and no PC fan noise in the background to deal with. In this article, I’m going to discuss the relevance of social networking to learners of English, some of the developments in learning English as a foreign/second language on-line and how this might shape the future of e-learning and learning management systems for EFL/ESL. So much to learn, so little time to learn it. For learners studying English in their own country, it is often difficult or inconvenient for them to get enough exposure to and practice with English. Classroom time with small groups (i.e. twelve learners or less) with a native speaker tutor who can give guidance on what constitutes “authentic” English at schools, colleges, universities and academies in most countries is at a premium and most only provide between two and four hours per week, although in some cases this can be as high as six. In my opinion, between two and four hours of small group classes per week is not adequate for students to learn the language and develop the communication skills they need. The majority of EFL/ESL coursebooks include workbooks that provide further written grammar, vocabulary, reading and sometimes even listening activities for learners to do outside the classroom in their own time. Also, tutors often encourage or require learners to read, listen to English radio programmes, watch English films and TV shows, keep diaries, etc. These are typically solitary activities that place the emphasis more on passive understanding or grammatical understanding of language than on active production and communication skills. Using the Internet as a learning resource. Growing numbers of learners are now taking the initiative for themselves and using Web 2.0 technology to practise their English. As well as passive comprehension practice such as watching videos on YouTube, listening to English language radio stations such as BBC Radio 4 and BBC Learning English.com, reading on-line magazines and news sites, learners now have an assortment of social networking sites to choose from where they can get in touch with other people with similar learning interests to their own. Currently, there is a bit of a “land grab” going on as small start-up companies such as Babbel and Live Mocha create social networking sites especially for EFL/ESL learners. Currently, learners can keep in touch with each other through instant messaging (chat), bulletin boards (forums), VoIP (Internet telephony) and, of course, video conferencing and shared on-line whiteboards. 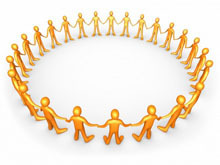 How do social networking sites affect learning management systems? Quite rightly, EFL/ESL learners just want to “get on with it” with what they already know. Many have already spent a considerable amount of time exploring and learning how to use the software applications on social networking sites for activities such as instant messaging, bulletin boards, VoIP calls and video conferencing. Personally, I don’t think it’s a good idea to insist that learners learn to use yet more, often poorly designed, social networking application interfaces. So why not just let them use the ones they already know? There’s a wide variety of software and services available and often the most widely used and known ones are free. Google and Yahoo! are popular and particularly good at supporting open protocols and open source (i.e. free and adaptable) software. It’s much cheaper and easier to use 3rd party web services provided by Google, Yahoo!, AIM, MSN Messenger and Skype because they have established networks that have been developed by highly skilled and talented teams of developers over several years. The really hard work has already been done for us so we get the benefits of reduced development time, huge, stable, well maintained and powerful networks, well documented APIs and public support forums for both developers and users. Having all this available for free has brought the cost of creating and running social networking platforms for e-learning effectively, within the reach of even small schools and academies. #2 – The most costly parts of developing, maintaining and improving the services are expertly taken care of for free. I think that in the near future, LMSs will have to incorporate and integrate more 3rd party social networking services or risk becoming irrelevant to EFL/ESL learners as they migrate to social networking sites for their communicative language practice. I’m sure that many learners will welcome the opportunity to link their own personal social networking spaces within LMSs so that they can share their blogs, comments, etc. with their classmates. They’ll also have the added benefits of having all their applications available from a single website, i.e. their school’s learning management system, and developing their English communication skills with topics and ideas that are genuinely relevant to them in a safe environment with people they already know and see in class on a regular basis.